No matter how you feel about Digital Rights Management, the fact of the matter in this day and age is that protecting your software (and thus your investment) is sort of a “big deal.” It was estimated by the Business Software Alliance that in 2011 software piracy alone accounted for over $63.4 billion in lost revenue. 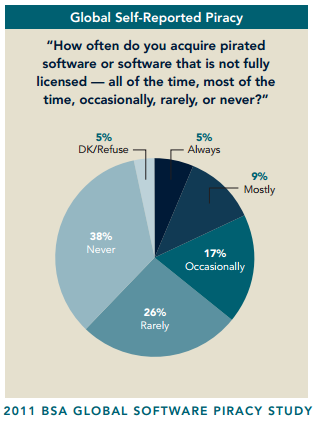 In fact, according to their study, over 57% of users self-reported using pirated software. Big deal indeed. So what is being done to combat this threat? Something that those without a full understanding of what is happening might find this slightly annoying. To protect their software from piracy and unlicensed copies, many software companies are now instituting a form of Digital Rights Management wherein the software must be on a computer that has a constant internet connection. Why? Because the software must ‘check in’ or ‘phone home’ consistently to the companies servers in order to verify it is a fully licensed and un-pirated copy. You can see quite clearly why this may annoy/hinder some people. This past week I was speaking to a client that needed barcode printing software on computers that could not and would not be connected to the internet. He was an honest businessman, and he had no intention of ever pirating software. Was he to be left out in the cold in this new age of anti-piracy efforts? See, software makers have come up with a work around to account for the fact that not everyone is going to always have a constant internet connection. In the interests of avoiding a SimCity or X-Box One level of industry backlash, an interesting tool has been deployed to protect the rights of users that can’t have a consistently running internet connection: The low key, simple, cost-effective USB key. Why would you create labels here? Because you can. For roughly the same cost as physically shipped media (in the day and age of everything being an internet download), software such as LabelView can be loaded onto your computer and ran at all times. The catch? You simply just need to have the USB key loaded at all times to satisfy the Digital Rights Management. In fact, with some software, you can load it onto multiple systems and just need to move the USB key around to use it fully. So while you will not get the benefits of having a copy that is constantly connected, you can take it on a plane with you and actually use your software. Or even use it in the middle of the Grand Canyon. Why would you create labels there? I don’t know, the point is: you can. The point I’m getting at is that while on the surface this new age of Digital Rights Management may seem annoying, unwieldy, and downright frustrating, there are hidden benefits. Some may argue that these ‘benefits’ are more ‘side effects’ but something had to be done to counter the complete drain on money that piracy was presenting. The fact that software companies are foreseeing the issues that can be presented in requiring an ET-like need to ‘phone home’ is a step in the right direction. The fact that solutions (the biggest of the buzzwords in our industry) are already being provided is a full jump in the right direction. Digital Rights Management is a controversy, and I’m not advocating for either side because the only dog I have in this fight are my clients. The USB key, in my opinion, is the correct solution until a better system is found.